There is Spanish treasure off the coast of Vero Beach. On rare occasions, a coin or a jewel washes up onto the beach from the galleons that sank in 1715. Then there are the permanent treasures on the beach, such as the home, “White Surf,” pictured above: A dazzling white concrete home intrepid in its preparedness to weather any hurricane yet an ethereal presence amid the vivid exoticism of its tropical landscaping. Even with the majestic exterior, we are unprepared for the treasures that await us inside and the ways in which those treasures, Chinese antiques, are elements in a harmonious aggregation of styles that includes modern, mid-century and Early American. The living room is designed for comfort. The soothing sky blue walls and diaphanous lavender curtains together with the upholstered mid-century sofa and chairs create an inviting, relaxed atmosphere. And then we see that the room is so much more than that. With the carved Chinese windows as background, the TV is brought into the décor rather than fending for itself against a bare wall (and let’s face it, few TVs are decorative!). Then we have the coffee table that was a Chinese day bed in a previous life. Here is an example of what I enjoy most about the art of interior design. See the peacock on the left in front of the mirror? 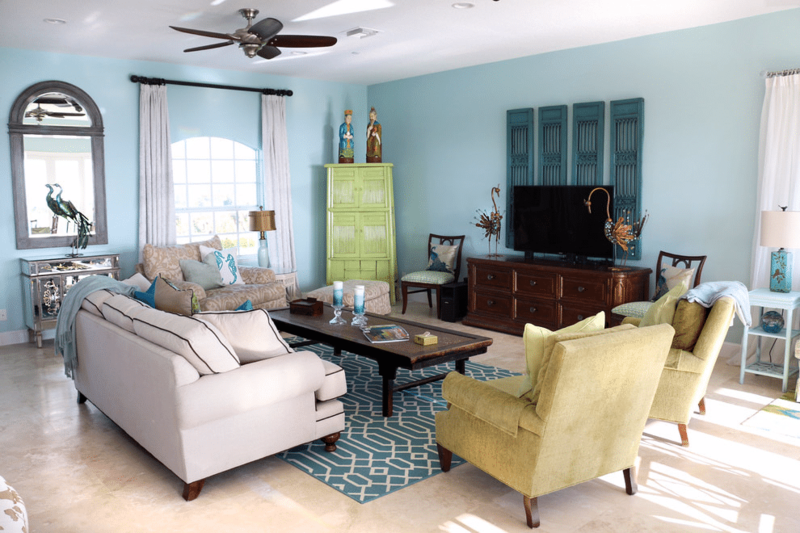 Now look at the throw pillows on the chairs on either side of the TV console. Peacock designs! It’s a seemingly small touch, but without that balance, the peacock or the pillows would have been an isolated element. This sort of attention to detail separates the artistes from workaday designers. 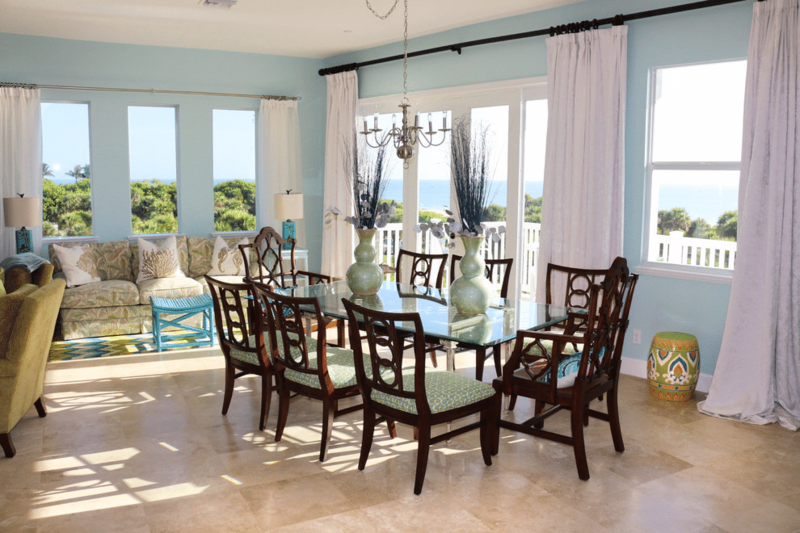 In the casual dining room, those same soft blue walls and delicate lavender curtains provide an ideal frame for the ocean view. This room exemplifies the harmony that can be achieved when the “rules” of design are broken and styles are “mixed and matched.” Traditional mahogany dining chairs sit at the modern beveled-edge glass table over which hovers an Early American chandelier. The Chinese influence is sparse but effective, seen primarily in the dried flower arrangements on the table: purple bamboo (which is rare) and the silvery white seed pods of the lunaria plant, the former a symbol of the Confucian precept of bending without breaking in adversity, the latter a symbol of prosperity and honesty. 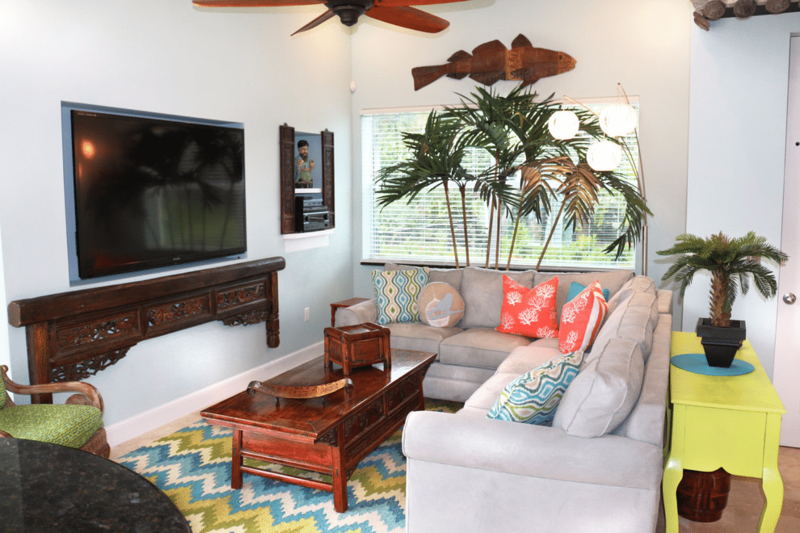 In the family room, we see the same comfort as in the living room with the mid-century sectional sofa arranged for conversation as well as for watching TV. Here the TV is “dressed up” with the addition of a Qing Dynasty roof beam. In the right-hand corner of the room, a contemporary floor lamp with graceful and curved bronze poles hold Chinese lantern-like spheres made from rice paper. 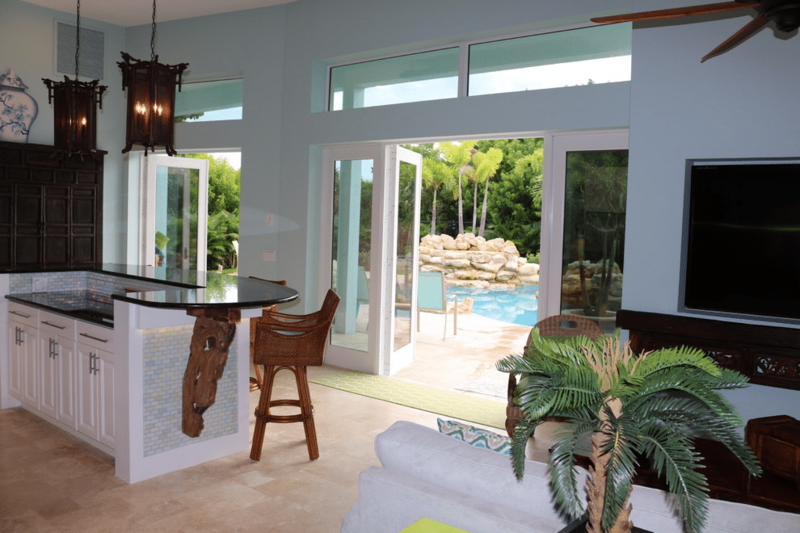 The kitchen on the ground floor opens up to become part of the pool patio. The kitchen and island bar are so starkly modern that they become a canvas on which to display the Qing Dynasty antiques, including the hanging lanterns and the corbel, once a supporting beam in an imperial home, now supporting the island bar. The rattan counter stools not only continue the antique Chinese theme but also keep with our modern-day concern of protecting our planet. Rattan is an easily renewable resource, and its use in products has little impact on the environment. I remain amazed, and impressed, with the skillful, ingenious and remarkably artistic manner of placing Chinese antiques among Early American, traditional, mid-century and modern désign elements with nary one discordant note. My primary takeaway is that, in the future, I will look past the label and see an object for what it is to me rather than what some indeterminate tradition says it should be.